News :: Oh the Places You'll Glide - Glide Bikes - Balance Bikes for 18 months to 10 years old! When people think of balance bikes, they think about learning how to ride a bike. This usually takes place in a backyard, a front yard, a driveway, a cul-de-sac and, perhaps, occasionally at a park. That’s great! In these controlled, or at least familiar, environments our children are able to be more comfortable and will in turn most likely feel more confident pursuing longer glides, and developing more complex skills. This doesn’t mean you’re restricted to only using these familiar places, though. Sometimes changing up the scenery allows mom and dad more fun, while also demonstrating to your child the benefits of bike riding; independence, the outdoors and the changes of your surroundings as you travel from one place to the next. Adding in a tinge of the unknown to your child’s bike learning experienc e creates a special bond between them, the outdoors and physical fitness. 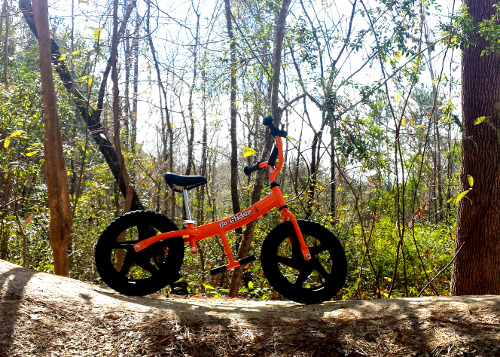 While Glide Bikes are often thought of as a training bike, many discount their ability to teach kids to balance through different terrains and in different environments. That’s why we’re showcasing one of our Go Gliders travelling throughout our hometown of Wilmington, NC. 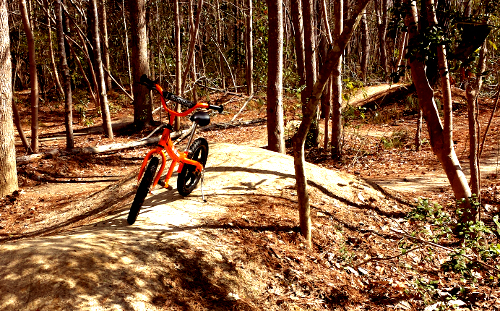 Each week we’ll show you a new place to take your Glide Bike. 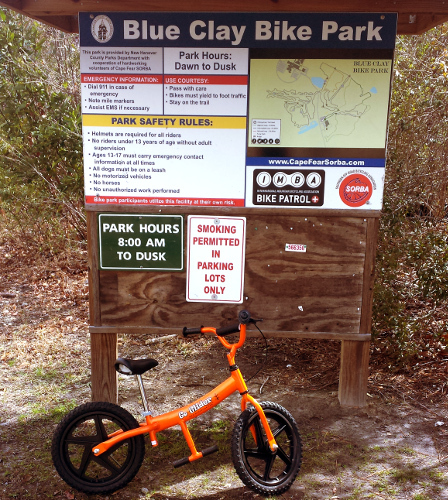 Please share with us some pictures of your favorite places to take your Glide Bikes too, by visiting our Facebook page. We decided to name our adventurer, Orville the Orange Go Glider! Today Orville found himself at Blue Clay Bike Park where he was not only surrounded by the beautiful day and great view, but a fun and challenging track. Take a tip from Orville and experience, “Oh the places you’ll glide,” for yourself!